One can only image the mystery and intrigue floating around in Matthew Porter‘s head, when what comes out in his paintings is magical and mystical. He’s been at it since he was a wee lad, but really got serious a decade ago when he opened an art gallery with his wife. Now, he focuses full time on his children’s book art prints, posters, magnets, keychains and clothing. 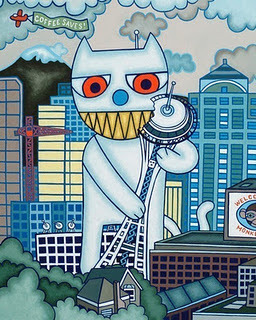 His most popular item is a print that features a cat destroying the Space Needle (again with the mystery and intrigue!) His original pieces are created with acrylic paint and pine wood boards. Then he sands, adds a varnish and …voila! His super power is that he can survive on toast and tea for days …the mark of a true artist! http://www.matthewporterart.etsy.com/ . You can't go wrong with a new book! Hope to get more collection to the library for 4 of my kids. If you have been interested just check out this site.